Support for Microsoft SQL Server 2000 ends this year and yet, one can find systems (production or otherwise) that continue to run on and support SQL Server 2000. Recently, we were tasked with porting a piece of functionality backwards, i.e. 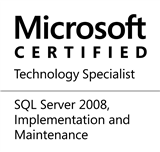 from versions that support SQL Server 2012/2008 to SQL 2000/2005. Unfortunately, this piece of functionality was designed to work with newer versions of Microsoft SQL Server and involved the use of table valued parameters which is not possible in SQL Server 2000. After a couple of hours of brain-storming, we realized that we could share temporary tables with the underlying stored procedures as long as the connection remained the same. Because the connection that created a temporary table is still active, the temporary table will continue to be accessible if the stored procedure is executed on the same connection. Here’s a small demo to help explain the solution. --NOTE that the connection has to be the same! The screen-shot shown below shows the output of the execution and it can be seen that the value for iA in the temporary table created by the calling application was indeed updated by the stored procedure and the results were available after the stored procedure execution completed. As demonstrated, temporary tables may be used for data exchange between an application and stored procedures or even between any two programmability objects (procedures, functions, etc). This functionality continues to remain valid even in the days of SQL Server 2012. The question, however is whether it would be preferable to use newer features like table valued parameters or not. Do let me know your thoughts on the same. As for those who need to continue support of Microsoft SQL Server 2000 for their products, I trust this post was helpful. This entry was posted in #SQLServer, Blog, Imported from BeyondRelational and tagged #SQLServer on April 4, 2013 by nakulvachhrajani. Nicely done, Nakul. I still use this method instead of Table Valued Parameters. It just seems easier. @Jeff: Thank-you for your time and feedback! Having worked on SQL Server 2000 in the initial stages of my career, it took me quite a while to get used to table valued parameters. Perhaps the only immediate benefit visible to application developers is that they don’t need to take care of explicitly dropping the temporary table. This point almost always makes the developers jump for table valued parameters. In my case, it was the application developers who made me change from temporary table to table valued parameters for generic patterns (two int columns, one int one date column and so on). Since closing the conection in Step 7 effectively ends the session, you don’t have to drop the Temp Table. It will drop all by itself. As a matter of fact, if the script is used a whole lot, there’s a benefit to NOT explicitly dropping the Temp Table. Microsoft made it so that, like an execution plan, the system will remember the empty table structure and reuse it for a bit more performance. The only thing else that I might add is that I’d likely use SELECT UNION ALL to drive the INSERT instead of multiple INSERT/VALUE statements. Each INSERT/VALUE statement will either create a separate execution plan or the system has to decide if there’s an execution plan that can be reused for each and every INSERT/VALUE statement. That, of course, takes relatively much more time than a single INSERT. Since it’s also likely that the data in the Temp Table was carefully selected and that all of the data will be used, you might also consider using SELECT/INTO to create the Temp Table which will be much faster than inserting into a pre-existing Temp Table. Agreed that SELECT/INTO won’t create a PK as you’ve done in your fine demonstration but, because the data was carefully selected as previously stated, there’s a very, very high probability that the optimizer will choose to do table scans instead of using the index, anyway. In fact, in some cases (you always have to test), the unindexed Temp Table may actually outperform the indexed version in joins or whatever the stored procedure is doing because the optimizer will automatically know that it’s going to have to do a scan. I proved that in one of the million row tests I did for my articles on Hierarchy conversions. But, again, nice blog entry. I use many of the “old ways” because they faster and easier to use than some of the “new” ways. It’s good to see someone post about the old ways because people forget about them or think they’re “not cool”. Thank YOU for taking the time to post such things.